Chocolate Chip Cookies Bites with Fudge Frosting– Bite-sized pieces of chocolate chip cookies topped with fudge icing. It’s fun, new way to serve cookies for your parties! And it’s a great alternative to cookie cake. A new year always comes with new resolutions to live a healthy lifestyle. Welp, if that’s the case for you, you may want to look away. Once you get a look at these chocolate chip cookie bites, you’re gonna fall off that wagon so hard. These chocolate chip cookie bites are inspired by the chocolate chip cookie cups that I used to get at Mrs. Fields kiosks at the mall. They’re basically chocolate chip cookies baked in a muffin tin and topped with frosting. Have you had one of these before? They are pure heaven. But absolutely sinful. So I decided to make them into little bites. I feel much better about gorging on cookies when they’re in a mini size. If you follow me on Instagram, you saw me post a cookie cake a few months ago that I made for my niece’s birthday. I was so so so happy with how perfect it came out – gooey on the inside but crispy on the outside. The perfect cookie texture. So I knew it would be the perfect recipe for these chocolate chip cookie bites. Instead of making the cookie bites in a round cake pan, I decided to make these in a 9×9 square pan so that each bite would be perfectly square. If you want the bites even taller, you can bake them in an 8×8 inch pan (note: the bites will take a little longer to bake since they’re thicker). Most cookie confections that have frosting typically have a colored buttercream frosting. But I think buttercream is too sweet. Blasphemous, I know. But fudge frosting is a whole other story. I am such a sucker for fudge frosting. It’s got a creamier and richer flavor than buttercream. In other words, right up my alley. So that’s what I used for these bites. So how did the final product turn out? Guys, let me just say…these cookie bites are ADDICTING! I have no self-control when it comes to chocolate chip cookies. Zero. But these cookie bites take my addiction to frightening new heights. I ate almost half of them in one day! ALL. BY. MYSELF. It’s that fudge frosting, guys. I am at its mercy. I ended up taking the leftover bites to a New Year’s Eve party and everyone went just as crazy for them. Success! I love these bites for parties because you can pop one in your mouth and be on your way. And then circle back to the table and grab 4 more. I told you guys: mini cookies = zero guilt. If you have a dark-colored pan, you will need to reduce the oven temp by 25 degrees. The dark coating absorbs more heat so it browns things faster, which means the edges of your cookie will brown before the center is cooked. If you want more information on this, here is a great article from my favorite informative blog, The Kitchn. You must must must let the cookie cake cool completely before slicing into bites. Otherwise, you won’t get a clean cut on the cookies and they will appear messy. I even left mine in the fridge overnight before slicing them to be extra safe. I used dark cocoa powder for the fudge frosting because it has a richer chocolate flavor. According to the source of the recipe, you can easily substitute regular cocoa powder or dutch-processed cocoa powder. I used a star-tip to pipe the icing onto my bites with a disposable piping bag. If you don’t have a star tip, here’s the one I have . Disposable bags are so much easier to clean since you just throw it away. And it’s much more sanitary. I used to have a reusable one and quickly realized how impossible it is to wash out the buttercream. And no matter how hard I tried, a little butter residue always remained. Yuck. You guys are gonna LOVE these. They are the perfect mini dessert for your next party since this recipe makes so many. Your guests will be so impressed! Bite-sized pieces of chocolate chip cookies topped with fudge icing. It's fun, new way to serve cookies for your parties! And it's a great alternative too cookie cake. Preheat oven to 350 degrees. Grease a 9x9 square pan with non-stick spray. Add butter to a mixing bowl and beat on high with stand-mixer or hand-mixer until light and fluffy (about 1 minute). Add brown sugars and mix on medium-high until smooth (about 1 minute). Mix in egg on medium until completely combined. Add egg yolk and vanilla and beat on medium speed until completely combined. In a separate bowl, whisk flour, cornstarch, baking soda, and salt until combined. Add flour mixture to wet ingredients about 1/2 cup at a time. Mix until smooth. Add 1 1/4 cup of chocolate chips (the rest will be added later) and mix until combined (5 seconds). Using a spatula, scoop all dough into prepared pan. Spread evenly, making sure to completely cover the entire bottom of the pan. Bake in preheated oven for 20-25 minutes. The edges will begin to darken around 15 minutes. Add foil around the edges to keep them from crisping too much. The cookie will be done when center no longer jiggles. You can also insert a toothpick to check if it's done. I like my bites slightly doughy so I take them out when the toothpick is slightly dirty. Add remaining chocolate chips as soon as you remove from oven. Let pan cool for 30 minutes and then place in fridge to cool for another 1 1/2 hours. Do not cut until the cookie cake is COMPLETELY cool. Once the cookie cake is completely cool, it's time to cut them into little squares. Using a sharp knife, release cake from the edges of the pan. Use a pancake flipper to help release cookie from the pan. Be very gentle so you don't break the cake. Place whole cookie on cutting board. Using a very sharp knife, cut cookie into 8 rows and 8 columns. This will give you 64 bites. Now, they are ready for frosting. See below for instructions on preparing frosting. Measure cocoa and, if lumpy, sift it. Add all frosting ingredients to the bowl fitted for a stand mixer. Use whisk attachment to stir ingredients on low until completely combined. Scrape down sides of bowl, if needed. Increase speed to medium-high and beat until smooth (about 1 minute). Let cool at room temperature while the cookie cools (at least 30 minutes). When ready to frost cookie bites, place a star tip in the bottom of a disposable piping bag. Cut tip of bag so tip slides right in but doesn't fall through. Fill bag about 1/2 full with fudge frosting. Twist end of bag to keep frosting in bag and help push it out. Using two hands, squeeze a little frosting onto each cookie bite, about 1/2 teaspoon. Immediately decorate with sprinkles or mini chocolate chips. Store bites at room temperature for up to 4 days (if they last that long!). Have you made these in mini muffin tins? What change to cooking time would be needed? Do you have to use the dark cocoa powder?? I have regular unsweetened cocoa powder will that work just the same? Yes, 1/3 cup of boiling water. Sorry I didn’t clarify. I’ll edit now so other readers don’t get confused. Thanks for letting me know! Oh my goodness, I want these RIGHT NOW. For breakfast! 🙂 SOOOO yummy! I’m sitting here with my kids drooling over these photos, and we are definitely making these soon! YUM! They look so amazing! Plus like you say smaller portions = less guilt Can’t wait to try them!! Oh my gosh those look amazing! 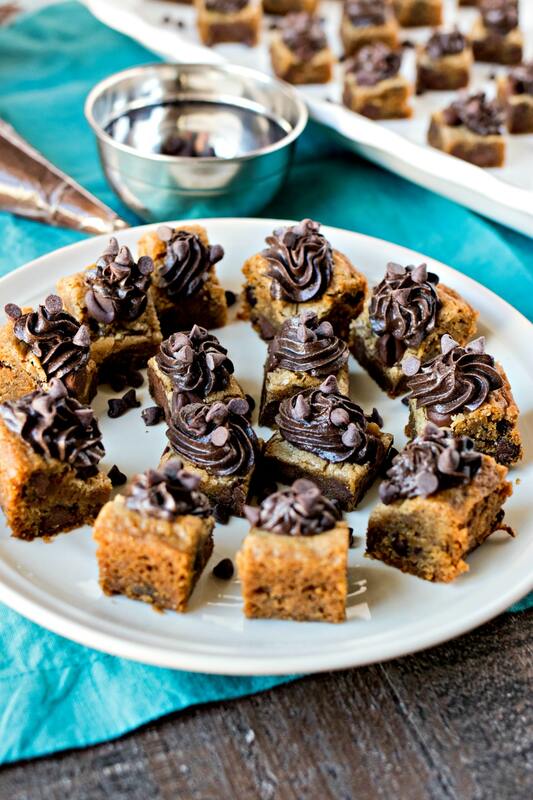 These chocolate chip cookie bites with fudge frosting would be a HUGE hit with my kids ♥ Thanks for sharing! These things look delicious! Pinned so I could make them later. Oh, these are up my alley! They look fabulous, and I appreciate the tips you’ve provided to make them that way! Love your comment about the new year a resolutions, lol. These look delicious!! These cookie bites look delicious and are so pretty too! Perfect for parties!! Yum!!! I love chocolate chip cookies and know I would love these!! Can’t wait to make them!! This recipe looks too good to walk away from! yummy! These are so cute! I love how you made them bite sized. Perfect for parties! These look insane! I am totally going to make these bad boys over the weekend. Ooh yum! This looks SO good! OMG I need to make these tomorrow – I’ll probably be putting all these ingredients on my grocery list and will make this ASAP. Thanks for this, my mouth is already watering! Those look delicious! I just pinned the recipe for later! Isn’t it fun to take a chocolate chip cookie or bar, adding some frosting swirl with more chips on top and ta da you have a impressive treat. Oh my YUM! Pinned for later. But I have a question. Do I have to use both light and dark brown sugars? I only ask because I don’t know if I can wait to go get the dark too LOL! Haha awesome! No, you can just use light if you don’t have dark. The dark just adds a little more color to the cookie. Happy baking! And let me know how they turn out! I’m SO hungry now! Love the beautiful photos, and the name of your website, very clever! OH MY GOODNESS. These look amazing!!! Yum. Well those look to die for! Definitely not helping my 2017 eating health plans!! 😉 Saving this for my next cheat day!